Pregnant with her second child, Emma attended a routine pregnancy scan only to have her whole world turned upside down. The scan revealed that her baby had a post-urethral valve: a tiny flap of skin that prevented him from urinating. 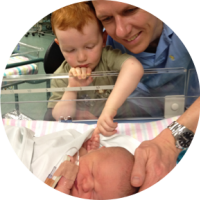 In a quiet room, the doctor told Emma and her husband Stuart that their son (who they named Joshua was unlikely to survive more than a few days after birth). The pressure created by urine building up inside Joshua's bladder had made it expand to about six times the size it should have been. His kidneys were so damaged they had little functioning tissue left. When it was time for Joshua to be born, his parents hadn't even set up a bassinet. "It has been a difficult two years, but the wonderful care from his medical team has kept us positive." Joshua was rushed to our Intensive Care Unit where several specialist teams were waiting to swing into action. It took feeding tubes, catheters, tests, medications, operations and even a special isolation room but the Intensive Care teams saved his life. Over a series of twelve operations, his urinary system has been reconstructed. Where possible, doctors have used a paediatric cystoscope, which allows treatment and diagnosis without surgery. For babies like Joshua equipment like this can mean less pain, quicker recovery times, shorter stays in hospital and significantly less scar ring. Joshua's condition meant that Emma spent a lot of time away from her other son James, however the family are now happily reunited at home. Joshua loves being at home too, and now that he doesn't have to wear nappies that go all the way up to his armpits, he's running around the house patting his stomach and relishing his new found freedom. His second birthday, a milestone his parents were unsure he would reach, was a very special day and Joshua celebrated with his very first bath.